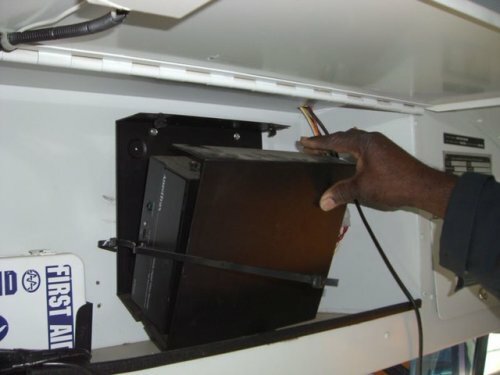 If you look closely at the top of the lock box, you will see the approximately 2 cents of soft rubber that was optimistically expected to support the weight of the heavy hard drive based DVR in this school bus camera or vehicle camera surveillance system. Engineering minds must take into account who these products are actually used in the field to insure catastrophic failures like this do not inconvenience school bus customers or cause the loss of valuable video evidence when these fragile poorly designed product crap out. The best value in school bus cameras, digital bus video cameras, vehicle camera, digital in-car video cameras, mobile video surveillance systems is 100% Solid State digital like the SD4m or SD4 series, which do not suffer the pitfalls of the fragile hard drive DVR design.